The fictional brand, "Timeless", has been created to encourage education and debate about egg freezing and fertility. 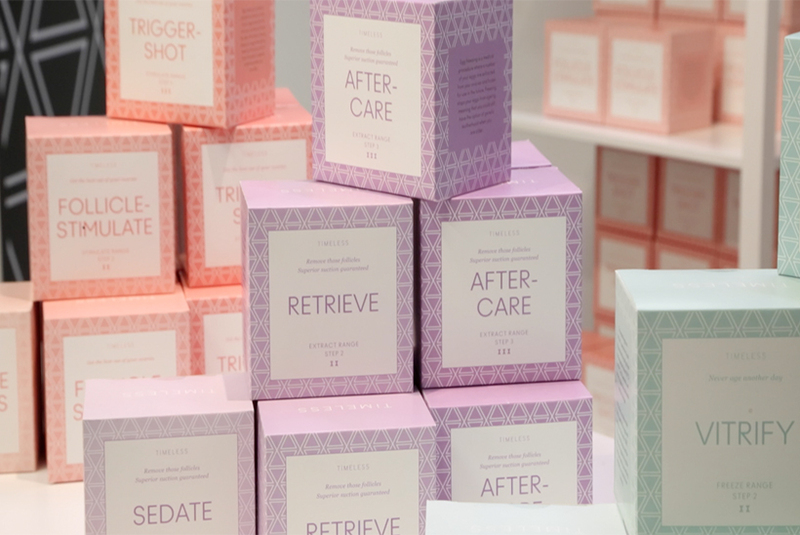 The project, put together by creative consultancy The Liminal Space, and supported by LSE & The Wellcome Trust, has opened a pop-up shop in Old Street Station with products on display that appear to be normal face creams, toners and serums. On closer inspection however, visitors soon realise that the goods are not actually for sale, and instead feature facts and figures about egg freezing. "Timeless was created in response to reading about Apple and Facebook and other companies offering egg freezing to female employees," said Amanda Gore (director, The Liminal Space.) "We realised that there’s a lot of misinformation surrounding it." The idea to present egg freezing as a beauty brand came about when Gore and Sarah Douglas (director, The Liminal Space) noticed parallels in the language used by brands to sell beauty products and the lexicon surrounding fertility: "It's very much about selling hope, rejuvenation and promises of eternal youth," explained Douglas. "It's been fascinating to see the public come into the shop," said Gore, "There's some shock, some surpise... and alot of interest."